Brazil nut trees are conspicuous in the non-flooded forests of Brazil, Bolivia, and Peru. Brazil nuts are high in calories, contains good quantities of vitamins, anti-oxidants and minerals. The nuts, in-fact, have been staple source of energy of native Amazonians. aturated fatty acids (MUFA) like palmitoleic acid (16:1) and oleic acid (18:1) that helps to lower LDL or "bad cholesterol" and increases HDL or "good cholesterol" in the blood. Research studies suggest that Mediterranean diet that is rich in monounsaturated fatty acids help to prevent coronary artery disease and strokes by favoring healthy blood lipid profile. The nuts are also a very good source of vitamin-E; contain about 7.87 mg per 100 g (about 52% of RDA). Vitamin-E is a powerful lipid soluble antioxidant. It is required for maintaining the integrity of cell membrane of mucus membranes and skin by protecting it from harmful oxygen-free radicals. 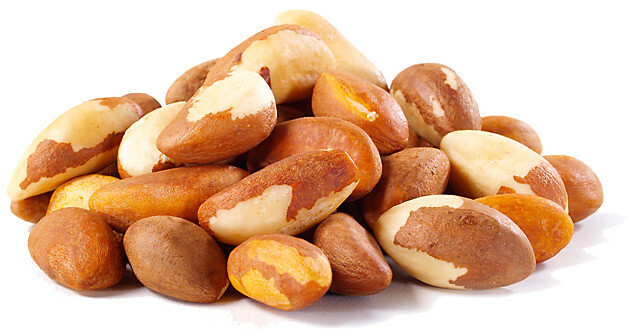 Brazil nuts hold exceptionally high levels of selenium. 100 g nuts provide about 1917 µg or 3485% recommended daily intake of selenium, rating them as the highest natural source of this mineral. Selenium is an important cofactor for anti-oxidant enzyme, glutathione-peroxidase. Just 1-2 nuts a day provides enough of this trace element. Adequate selenium in the diet help prevent coronary artery disease, liver cirrhosis, and cancers. Furthermore, just as in almonds and pine nuts, brazil nuts too are free from gluten protein. The nuts, therefore, are one of the popular ingredients in the preparation of gluten-free food formulas. These formula preparations are, in-fact, healthy alternatives in people with wheat food allergy and celiac disease. Additionally, these creamy nuts are an excellent source of B-complex group of vitamins such as thiamin(51% of RDA per 100 g), riboflavin, niacin, pantothenic acid, vitamin B-6 (pyridoxine), and folates. Altogether, these vitamins work as co-factors for enzymes during cellular substrate metabolism inside the body. In addition to selenium, they contain very good levels of other minerals such as copper, magnesium, manganese, potassium, calcium, iron, phosphorus, and zinc. Copper helps prevent anemia and bone weakness (osteoporosis). Manganese is an all-important co-factor for the antioxidant enzyme,superoxide dismutase. Brazil nuts can be eaten all alone. Additionally, they can also be enjoyed roasted, salted, or sweetened. They also used in fudge, puddings, pesto, chocolates-bars and crunch bar preparations. Coarsely ground brazil nuts sprinkled over fruit/vegetable salads. They are also used in desserts, particularly in fruitcakes. They can also be added to soup as well as meat and vegetable dishes. Bazil nuts are packed with nutritions and minerals.